A sense of unity: Depending on the size of the Deaf community, Deaf people congregate at activities such as bowling leagues, Deaf clubs, Deaf plays, and fundraisers. In Los Angeles, the Deaf community is very large. Subgroups inside the community consist of Russians, Chinese, Italians, Hispanics, Jews, and many others. Each of these groups has its own respective traditions, customs, and celebrations. As a whole community, they come together for events such as the Lotus Festival, Deaf West Theater, and Deaf Awareness Month. ASL pride: Deaf people speak of American Sign Language (ASL) quite often in conversations. You may attend plays and parties where ASL is the main topic. The Deaf community is very proud and protective of this language, so it’s often a hot topic. Signing speed: When you watch Deaf people in conversation and you can’t understand anything that’s signed, don’t lose heart. Novice signers often don’t understand Deaf nuances and abbreviations, and they often have a hard time keeping up. Stay with ASL; before you know it, you’ll be signing like a pro. And, just so you know, few things are more volatile in the Deaf world than a hearing person who, having taken a semester or two of ASL classes, proceeds to lecture a Deaf person because he or she doesn’t sign the way the teacher instructed. As you find yourself with phone numbers of Deaf friends and invitations to Deaf socials, you’ll be well on your way to being a constant student of ASL. Like everyone who studies, learning new ways of signing ideas will be commonplace. The possibility of going to school to professionally hone your skill and take classes in Sign may be an endeavor you soon realize. Many people have no deafness in their families and learn ASL and Deaf culture at a rudimentary level. Time takes care of the rest as it gives way to proficiency through practice. Some people have Deaf siblings or Deaf parents and know ASL through this avenue and understand Deaf culture because of them. These people have had deafness in their lives from the beginning. All people who enter the Deaf world face a certain dynamic. Think of the dynamic as a bull’s eye. At the center is the core Deaf community leaders; these are the movers and shakers of the Deaf world. The next ring is the Deaf community as a whole. The next ring are Children of Deaf Adults, or CODAs, who are hearing people who choose to become interpreters. Following them are interpreters who have no Deafness in their respective families. On the outer ring are those who provide services to the Deaf community members but still have the ability to sign. These are teachers of the Deaf and can hear — vocational rehabilitation counselors, teachers at Deaf schools, and professional workers who provide services for the Deaf. 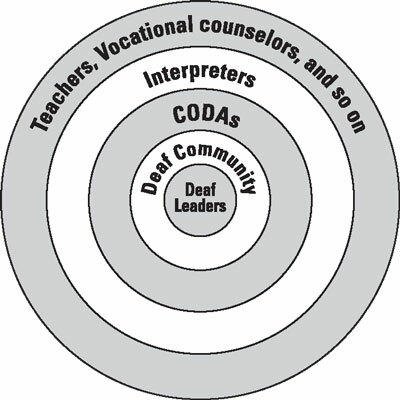 Think of the layers of the Deaf community like a bull’s eye. Joining the Deaf community is not something that anyone can just decide to do. Attending your first Deaf function with the Deaf person who invited you is appropriate. Attending a Deaf social without first receiving an invitation is never a good idea. As you arrive, your host, the one who invited you, will introduce you to his or her friends, explain how you know each other, and mention that you’re learning ASL. Saying both your first and last name is customary, and a good rule of thumb is to let people know that you can hear and that you’re learning Sign. They’ll know this already by watching your lack of fluidity in the language; however, through this admittance and vulnerability, bonds of trust are made. As you walk through the social, you’ll notice Deaf people signing in fluent ASL, but when they see you approaching, they’ll revert to signing in an English word order while using their voices. They do this to accommodate you. They already know that you can’t keep up with their pace or fluency, and they change their modes of communication to make sure you can understand the conversation. This is called code switching. After you depart from the conversation, you’ll notice that the Deaf people will go back to turning off their voices and will converse in proper ASL. Don’t take this personally as an offense. The gesture of using more English by the Deaf folks for your benefit — code switching — is something that all hearing people experience when they attend Deaf socials for the first time.